The modes and systems by which we engage civically are different from those by which we engage with each other, socially. This insight surfaced early in our interviews and observations. It’s challenging—some might say unappealing—to incorporate conventional means of civic engagement into our daily lives. Low participation leads to weak mandates and an inaccurate understanding of our motivations, needs, and desires; therefore, policies and politics seem out of touch, in turn feeding the weak participation. We went on to conduct over fifty formal interviews across the civic ecosystem, speaking with mayors, city council members, city managers, citizens, undocumented citizens, retirees, millennials, activists, the disenfranchised, and the disengaged. Five interconnected themes emerged. In some ways, how these themes correlate to civic engagement is familiar—people feel too busy to stay engaged or informed, or the information itself is difficult to trust or understand. Some don’t feel they know how to have impact or how their engagement will lead to it, while on the other hand, the most engaged tend to be those with power or who know how to access it. We developed deeper insights as well. Considering TIME for example, there’s a tension between the mindsets of civic officials and their constituents. While officials’ are largely preoccupied with the long term and their legacies, constituents understandably feel an immediacy with the short term. One Mayor told us about replacing his city’s old water management system. It was flooding all too often, yet although a new one would resolve the issue for decades, he felt exasperated that people mostly contacted him about the construction. He lamented their myopia, “people [were] upset because they can’t park in front of their favorite restaurant!” Another mayor echoed the challenge, “I want people to know that the institutions will still be around when I’m not.” Interestingly however, these mindsets flip around election time. Especially within divided communities, or in a time of hyper-polarity, officials forfeit the long term health of their communities for short term gains. Also within TIME, it’s a matter of who has it or has incentive to make it. As we observed, the most engaged were typically retirees and who we called “politicos & political hobbyists”, those with particular skills or interests that lend themselves to be highly engaged. Relating this to IMPACT, politicos & hobbyists knew how to work the system; for example, they employed strategies to dominate city council meetings and quell dissent. Retirees tended to be homeowners, with longer and deeper ties to the community, so they had a clear motivation to stay engaged. We thought, where does this leave those who are less rooted? Today, it’s becoming more common to switch jobs, to move around, and to rent rather than own. Our systems of engagement aren’t designed for “transient voters”. With an eye on Voting, while folding in the other themes and insights, we developed How Might We’s and used mind maps to explore the qualities our intervention could include. Voting, in it’s current form, does not correspond to our daily lives. Without a clearer connection to our communities and the places and the ways in which we socialize, voting will feel dissatisfying and blunt. We wanted to lower the intimidation around voting, make it more frequent, and bring it into the modes of our current activities. Our intervention enables people to quickly share how they feel about their city—joys, frustrations, wants, needs—and where they’re feeling it. Also, the government is clearly not the only service-provider in our lives. In visualizing the pulse of the city, we hope to encourage collaboration between individuals, groups, nonprofits, and companies to address our civic challenges. 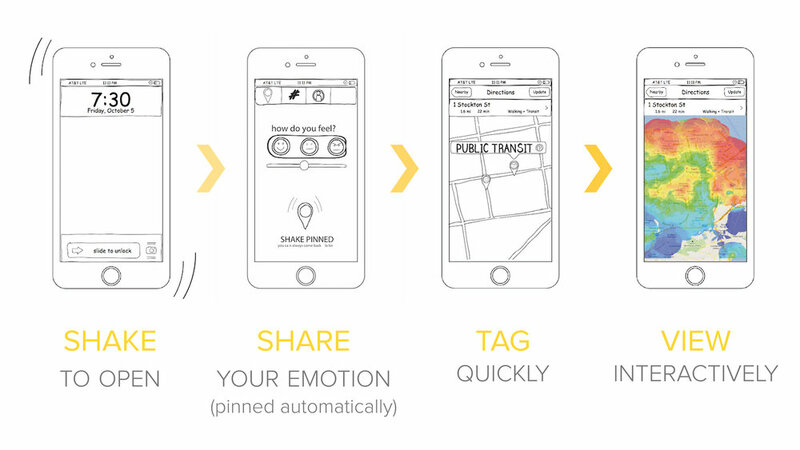 Users activate the app by shaking their smartphone, then quickly select an emotion to color their post, and tag it e.g. “public transit”. Their location is automatically pinned. “Shakes” are aggregated onto an interactive map of their city, creating a sentiment heat-map. The data-visualization serves as feedback to user engagement and helps civic leaders, both in and outside of government, to understand their city. There are other possibilities as well. Similar to live-tweeting and Facebook Live, picture such a sentiment map populate while an event is taking place. For example, during the next televised political debate or speech, imagine viewers at home shaking their phone as a sort of digital applause. Metaphors is one of my favorite tools for synthesis. In the inset below, I give an example of how I applied it to advance this project. Given the inherent complexity of civic life—with its interrelated systems, complicated relationships, and various influencers—this project was especially challenging. Tools and practices like visual frameworks, journey maps, mind maps, and storyboarding helped us tremendously in working through our findings, but they would feel either too narrow or too blunt with respect to the ecosystem. While we understood the nuance, we were stuck in defining our point of view so that we could move forward as a team or bring others in on the collaboration. Developing a metaphor greatly advanced our work.